When I was at school, careers’ advice – at least at my girls’ grammar school – was essentially non-existent. Perhaps boys’ schools did better; after all, for my generation of women, ‘careers’ weren’t a matter for serious concern. I certainly believed, as I expect many of my peers did, that going to university would lead to a few years of random work followed by marriage and housewifery with a child or three to keep me busy. The pictured advertisement from my school magazine illustrates neatly the sort of expectations that were implicit in society around 1970, if not in my actual school where we were at least encouraged to get a degree. 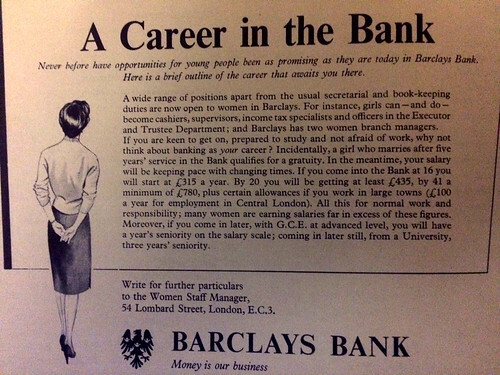 Get yourself some nice high heels and a tight skirt and girls like you could become ‘cashiers, supervisors, income tax specialists and officers in the Executor and Trustee Department.’ As even more of an inducement this ad added ‘Barclays has two women branch managers’. according to the introduction to a recent House of Lords debate on the topic, introduced and championed by crossbench peer Lord Aberdare. This shift in responsibility has led to fairly disastrous consequences for years of students in many schools. Reading the report of the whole debate in Hansard gave a gloomy picture of what has been, but more optimism about current changes. A new organisation, set up in 2014 the Careers and Enterprise Company, seems to be moving things very much in the right direction. Bursaries are available – although not necessarily enough –to help schools identify and train their careers leaders. Skilled help should be becoming available to the children coming through the system now and in the future. a remark made by LibDem Peer Baroness Garden of Frognal. Science is, apparently, not creative! I wonder how many ‘dumb points’ she has benefitted from generated by ingenious and creative scientists around her. His views have clearly fallen on deaf ears. We are still up against the idea that scientists need to be segregated from the creatives of the creative economy (you know, people like those who design and write computer games – not techie STEM folk of course). Who believe that our schools cannot teach creativity in science as well as in art or music (although to be fair the curriculum may not make it easy to do so, but that’s not the fault of the science). It was reassuring to hear from Christopher Frayling (in a private conversation over dinner last week) – former Chair of Arts Council England and Rector of the Royal College of Art no less – that he too was deeply irritated by this abuse of the word creative. I hope more people will speak up about this travesty of the use of our language, as well as a complete failure to understand how science operates. Don’t get me wrong. I believe we should ensure all our school children get exposed to the whole spread of disciplines. The government’s emphasis on STEM education is absolutely part of a drive to ensure our children are equipped to deal with the world as it is, but it definitely should not drive out the richness of the other subjects. I was fortunate enough to be exposed to wonderful musical opportunities at my school and I did 3 languages at O Level as well as History for my humanities dose. I loved most subjects (with the exception of biology). Careers advice may have been non-existent in my school, but I certainly got what these days would probably be termed an excellent STEAM education (with the added A being arts). Let us push for a world in our schools that recognizes the reality not these false dualities which limit choice and imagination. This entry was posted in Education, Science Culture and tagged Career advice, Lord Aberdare, William Blake. Bookmark the permalink. One Response to What Does Creativity Mean to You? Careers advice at my boys’ Grammar School in the mid-1960s was also more or less non-existent. Really, the only guidance we got was whether we should try for Oxbridge (by staying for a third year in the 6th Form) or go to a red-brick University. I cannot remember Polytechnics even being mentioned although we had one in our city. Nowadays I go to career fairs in my role as a STEM Ambassador, where there is a wide range of careers on show with most of the children attending being at the stage where they are about to choose their ‘A’ level subjects. Generally, I think that teachers are much better prepared now than they were in my day.